Classic Rock 97LAV celebrated the final Appearance of KISS at the Van Andel Arena on Saturday, March 9. Fans got to witness performance artist and entertainer, David Garibaldi, create a 5′ x 8′ (5 foot by 8 foot) KISSTORY painting that helped to celebrate this once in a lifetime final KISS concert in Grand Rapids. The painting with be auctioned off and benefit the Grand Rapids March of Dimes—this painting will be unique to Grand Rapids & will be an instant collector’s items. 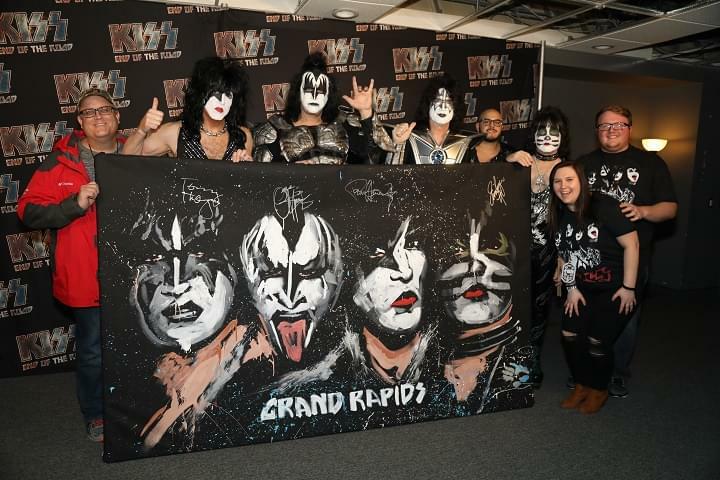 Check out WLAV producer, Travis Gibbs, the artist, David Garibaldi and members of KISS, down below with the painting!